'La Rondine di Mare' is a charming villa set in an acre of Mediterranean countryside that boasts spectacular sea views. It is on a quiet road not overlooked by other properties. The house is very big and nicely divided so that everyone has some private space. The sitting room which has three double glass doors that lead outside. Two wings lead off the sitting room. The first leads the master bedroom. The other wing leads past the kitchen and dinning room, to a bunk bed room and shower room. The dinning room has a large round table which is ideal for feeding children or using when it rains and the kitchen is long and easily fits several adults cooking simultaneously. The kitchen has another exit that leads to the car park and terrace. Two short, external flights of stairs lead to the two guest suits. The house is decorated elegantly with an eclectic style of the well travelled. There are 3 terraces. The main one off the sitting room has a teak dining table that seats up to 15 people and several trees that create very welcome shade from the summer sun. In addition there is a large square umbrella and pergola that has a canvas covering providing a large amount of shade. The gardens and grass lawns are ideal for sunbathing or playing catch with your children. 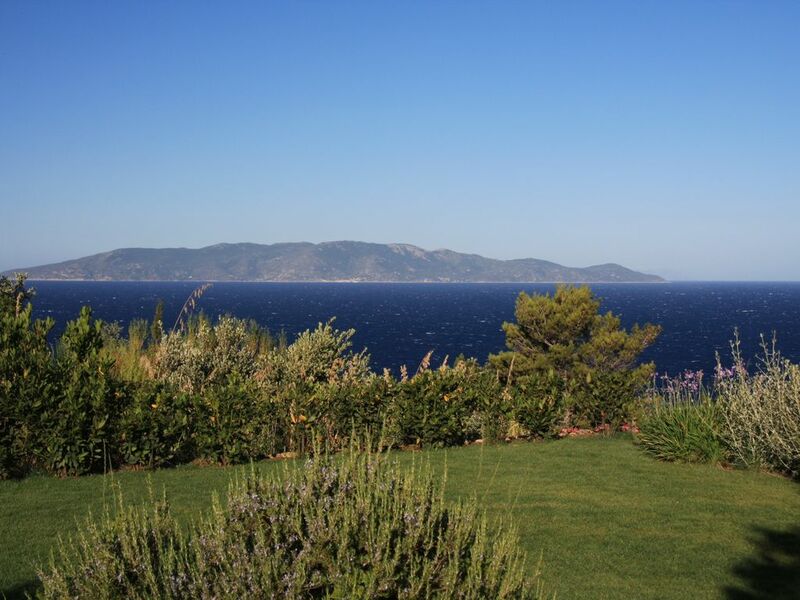 The view from this side of the house is due west towards the island of Giglio. Most evening there are spectacular sunsets! On a clear day you can also see the islands of Monte Cristo and Corsica and if you are very lucky even Elba. The second terrace has a bamboo roof and teak table for 4. We like breakfasting here or having an drink while looking at the island of Giannutri. The kitchen terrace has recently been resurfaced and is a useful space for your children to play in while you cook or take a break at the other side of the house. There is also a dedicated area for drying clothes. The Monte Argentario peninsular: You can explore the near by port of Santo Stefano and the marina at Porto Ercole with their fish stalls, markets, boutiques and restaurants. Take the ferry to the islands of Giglio and Giannutri or visit the inland medieval towns of Magliana in Toscana and Capalbio. Or even swim under the waterfall at the Saturnia hot springs. A perfect location for all ages. We are an Anglo-Italian family with an Italian mother and British father. We grew up in England and spent idyllic summer holidays at the villa with our Italian grandfather, his extended family and loads of cousins. We are four siblings based in Rome, Paris and in the UK. It is great for large families and people that want a little privacy. The house is well divided so that you can be together or relax on your own. The road is quiet with only 5 other villas and a very famous Italian pop star (Antonello Venditti) for a neighbour (who is rarely around and is very quiet!). The area is really safe and there is a lovely welcoming feeling at the beach (just say my name). The beach club has everything that you could need. Lifeguards, bar, restaurant, showers, playground with swings and ping pong. There are also many places where you can sit in the shade other than your umbrella. There are safe caves to explore and a diving board. The playground is near the entrance where a lady sits, who loves children and keeps an eye out for them all. The master bedroom and guest suite have bathrooms with bathtubs and hand painted tiles. The double guest suite and bunk bed room have modern bathrooms with showers. Wireless (ADSL) access is available. The work the owners have made on the new bathrooms, terraces and kitchen have really made a difference. Amazing- we've traveled the world and no where was as breathtaking and relaxing as Cala Piccola. The views and outdoor living areas are breathtaking - the beach club is beyond words. The home's sea views, landscaping, four outdoor seating areas and privacy make you never want to leave - then you go to the beach club which is a giant private cove preserved for a limited number of members and hotel guests and are awestruck. The layout of this home is ideal for an extended family/friends - with 3 bedrooms in the main area and two other areas with their own entrances. As per previous comments, the home is a tad dated- but who would ever want to spend time indoors with all the great outdoor areas. We will definitely be back on our next trip to Italy. casa ampia, adatta a 12 persone comode. Such a great property, very comfortable, the Cala Piccola Beach Club was a perfect way to spend the days with kids and Santo Stefano lots of fun at night. The owner could not have been more helpful and very easy to communicate with. Would highly recommend and would love to come back. Spacious villa with a good feeling of being "home"
This villa helped a lot to make our vacation really good! 9 adults and 2 children were fit in all the bedrooms without problem (we even left one unused). The terrace was a fantastic area where we had every breakfast and a lot of other memorable meals and drinks. The view towards the ocean is incredible! All the furniture and wall decorations in the house gave a nice feeling of actually being at home. The beach club was also nice to spend some time at, and the sand beaches along the coast towards the mainland worked pretty good for us too (about 25 minutes by car). For restaurants we mostly went to Porto Santo Stefano, one day to Porto Ercole, but the hotel close to the villa was also a good option as we found out the last day. Pity we didn't think of trying their breakfast buffet until it was departure day, but perhaps next time! As for the owner we got really good information and recommendations about what to do (restaurants, beaches, vineyards etc.) and what to think about regarding the villa. When emailed questions before the vacation the answer was never more than a day away which was very appreciated. UNA VILLA VERAMENTE FENOMENALE 12 PERSONE ABBIAMO PASSATO UNA SETTIMANA INDIMENTICABILE SPAZIOSA CON UN GIARDINO IMMENSO PULITO CURATO E BELLISSIMO...CAMERE CONFORTEVOLI E BEN ORGANIZZATE 4 BAGNI CUCINA SPAZIOSA. TERRAZZA IMMENSA TAVOLO DA PING PONG...TV SKY...PRIVACY ESTREMA ED UN CLIMA VENTILATO AL MASSIMO.... IN POCHE PAROLE "IN CAPO AL MONDO" AHH DIMENTICAVO ISOLA DEL GIGLIO DIFRONTE PER UNA VEDUTA FANTASTICA!!!! CI TORNEREMOOOOOOOOO!!!!!!! Siamo contentissimi voi abbiamo goduto della vostra visita. Speriamo che ritorniate ancora. Monte Argentario is an Italian well-kept secret. This peninsular on the Tuscan coastline is renowned for its spectacular setting and seashore. Two parallel roads lined with pine trees and kilometres of sandy beach link the peninsula to mainland Italy. Prototypical Italian hairpin roads wind their way round the mountainside to the ports of Porto Ercole and Porto Santo Stefano. Poised between the mountain as its backdrop and the Mediterranean Sea is the picturesque Bay of Cala Piccola. Popular sports in the area include swimming, snorkling, diving, cannoing, cycling, walking and tennis to name a few. Boat trips to Giglio Island run reguarly from Porto Santo Stefano. The Argentario Golf Club, with its par 71, 18-hole course, excellent practice facilities and hotel, is set to play an important role in Argentario’s leisure and tourism development. The club is located in a protected oasis of Mediterranean maquis, with fine views across the valley to the open sea, the Orbetello lagoon and the hills of the Maremma in the distance. The undulating terrain, extensive use of water hazards and unforgiving rough provide an enjoyable challenge for all abilities. Whether you are fine-tuning your technique or learning the rudiments of the game, the Argentario Golf Club offers a truly diverse and unique golfing experience. Look no further for your next golf holiday, golfing break or corporate golf event! Notes: Guests are welcome (handicap of 36 required) – however, it necessary to reserve a tee time and soft spikes must be worn. Dogs are permitted, provided they are kept on a lead. Please note there is no central heating available. There is however an open fireplace that is usuable.